I always loved the green and purple ketchup! So wrong, but so right at the same time! Your blog is so, so inspiring—keep up the good work! I’m loving the look of that rainbow cupcake. There’s just something about the absurdity of food coloring that made a ten-year-old me think he was eating super-mutant secret stuff, and, in due time, I would get some crazy super powers. Heck, when blue M&M’s first came out, I was convinced that after a couple of handfuls of those bad boys I’d be seeing through walls and punching through steel. But hey, a guy can still try, right? I will march into the nearest grocery store and buy my excess food coloring with my head held high. Move over, regular colors. It’s time for the bizarre! Breakfast tomorrow is gonna be AWESOME. As a ketchup addict, colors other than red is just disgusting. That pic looks like it’s filled with snot. Or at the very least, Flubber. I worked in a grocery store when purple and green ketchup came out. I knew I wanted to try it, but I wanted to make an occasion of it. I waited too long. It was discontinued quickly and I never got my chance. I made camouflage cupcakes the other day with camouflage icing for the HBO premiere of “The Pacific”. I’m liking those rainbow cupcakes though! Man, it feels like us Germans are missing a lot. Ok, we did have green ketchup for a while and we do have black rice, but when it comes to the rest of your list.. never in my life have I seen coloured white bread, cristal coke or green beer. And I would definitely love to taste one of those rainbow cupcakes! Awesomeness! Americans are a strange lot, aren’t we? I love colored food! I like to mix it up a bit and color food for my daughter, it makes it fun for her. The only wrong colored food that bugs me is green ketchup. I haven’t seen it in a while, but it freaks me out for some reason. I miss Crystal Pepsi so much! That stuff was SO good !!! In my life I have often been a serious junk food junkie. There was a time when it was no big deal for me to sit down and eat an entire box of sugary cereal in one sitting. That’s how I found that if you eat enough Fruit Loops, you will poop in rainbow colors. Yes, it’s a bit gross, but still Awesome! Yeah, that just reminded me that my friends and I learned in a one-week mission trip that if you eat enough yellow flour, you will poop yellow. I agree, really nasty, especially because we used to go in the middle of the jungle in a certain spot, so we could see what the person who went before did. When I was pregnant, fruit loops was one of the things I craved. I never got morning sickness or anything either….but about 8 months in and a bowl full of fruit loops for breakfast, i got sick. I couldn’t make it to the bathroom in time and ended up vomiting a rainbow on my carpet. It was so gross, but colorful. This reminds me of the fact that if you drink fierce grape gatorade you will poo the most awesome green color ever. You would think purple, but nope, its electr0-green! Yeppers…I have most certainly pooped a rainbow!! I find coloured ketchup to be horrifying. I am; however, in complete awe of that rainbow cupcake. gods, the work that must have gone into the making of it. My son and I have made these rainbow cupcakes they’re actually pretty easy. all you have to do is separate even amnts of batter into separate bowls and food color them to the desired color and spoon them in cupcake wrappers put em in the oven and bake…fairly easy…and yes very very pretty!! Then it looks like it’s just whipped cream for the topping, you can spoon it into a plastic bag and cut a corner off and squeezeit out in the spiraly shape that’s on there!! I love red velvet cupcakes and when I learned that all that made them red was a thing of red food coloring I was shocked. Strange franken-science. Black jack taco’s from Taco Bell are the bomb!!!! LOVE Them! And I want some purple ketchup , my kids would go crazy! Btw, I do consume black/red rice regularly. Nice post! This is my favorite sentence ever. Who needs alcohol when you have crazy-colored chips?! cant believe you forgot GREEN EGGS AND HAM!? I loved it when Hershey’s chocolate went green for the hulk! Also, thanks for the positivity injection every morning. This is my favorite website! i have to say, this is the first “1000 awesome things” item that i completely reject. food coloring has always grossed me out. most of the commercial items you list aren’t even sold anymore. there’s a reason for that – people don’t like it. A few summers ago, my friends and I were bored and decided to make a vanilla cake with food coloring. We wanted it purple, but we only had the primary colors. So we mixed red and blue. It looked purple when we mixed it, but when it was done baking, it was brown. It also probably didn’t help that we added sprinkles in the cake. You couldn’t even taste them ha. This may be the first awesome thing that I’ll have to disagree with. I just can’t say I like any of these wrongly colored foods. I like foods to have their appropriate color, and I’m willing to risk being called boring. I love the idea of green and purple ketchup. I didn’t even know there was such a thing. Isn’t pepsi/cola naturally green? Green ketchup? I wouldn’t eat any ketchup that color. I like white chocolate though and it is almost impossible to find. No it isn’t. It’s at any grocery store in the baking/candy aisle….where are you from? Typo alert! I hate to be the jerk who says it … but I hope it doesn’t show up in the book! “Made BY little old ladies,” not my. This is the first one that I have to completely disagree with. Green food coloring makes me nauseous, I always have this memory of green rice krispy treats that didn’t sit well in first grade. Things that are their unnatural color make me nervous. Things are already too genetically altered, do we have to add to the confusion?? I hate to ruin it for you, but most of the stuff mentioned is already colored. Pepsi is not “naturally” brown. Ketchup is not very red until it’s colored. The different colored veg’s ARE their natural color, and some of the corn products’ colors are from different colored corn (like blue corn). Yellow cake contains yellow food coloring. in the veggies section you should add purple carrots!!! my sister grew some last summer and they’re purple on the outside, but orange on the inside!!!!! and taste just normal, of course! they’re great! so much fun! how neat. I had never seen green ketchup before! I REALLY want to find that strange colored produce. Yeah,the Shamrock Shake didn’t make its way to the Sacramento area. None of McDonald’s’ promotions (Shamrock Shake or the McRib) ever get to the 916 anymore. Up yours,McDonald’s! Crystal Pepsi didn’t taste right. The Black Jack Taco should have that Monterey Jack cheese. It looks blah. Don’t drink the green beer. It’s leprechaun pee. Black rice is wonderful. It’s not dyed — it’s a real heirloom variety of Asian rice. It’s actually really, really dark purple (and will leave purple stains on plastic dishware, by the way). I can’t really describe what it tastes like, except to say it tastes like awesome. Actually, there are several black or near-black varieties of rice, but the one I’m talking about is the one with the short, chubby little grains, like arborio rice. There’s a natural foods store in my area that sells it in little bags at obscene prices, but I buy it anyway because it’s so good. Purple potatoes turn white when you cook them, but Yukon Gold ones stay yellowish, and they’re delicious. They’ve become my favorite potato to put in stew. Where’s the colored pasta in this? You can get pasta in all sorts of crazy colors. Not just dyed with food coloring, either, but colored with things like beet juice, spinach, or *shudder* squid ink. I mean, I like squid and all, but the INK? Green ketchup can be made at home, all you have to do is grow your own Green When Ripe tomatoes (these are Heirloom types) Easy peasy, then make your own ketchup! Once, my mom cooked purple potatoes. Isn’t that COOL?? Ah, and the non-malt beer (contains almost 50% dairy!)!!! You are right. That is a picture of a cloudberry, not a yellow raspberry! I think it’s actually a salmonberry. How bout Kraft mac and Cheese!! What a brilliant orange! 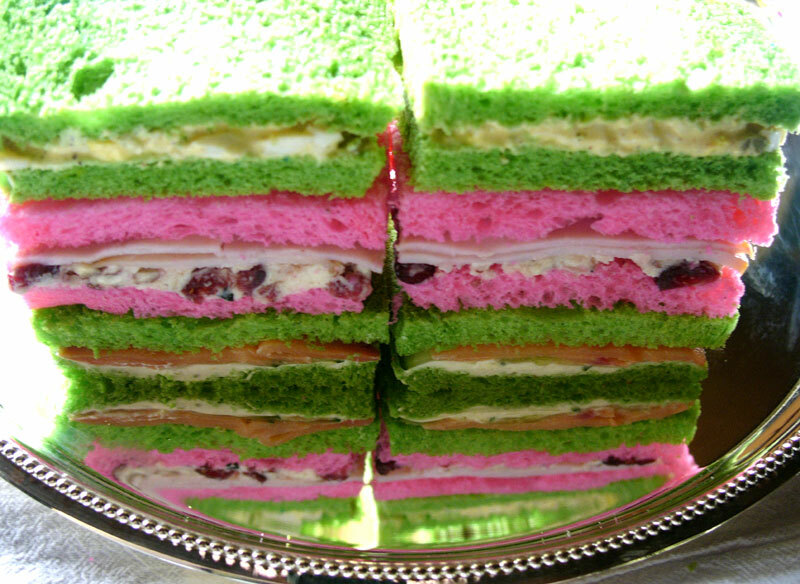 Excuse me, but what is it with you Americans and that oddly- coloured food? I’d never eat something that looks purple unless it’s eggplant. In my town they make stuff with green and red icing and only!! Americans buy it. I just don’t understand it. It tastes better without the colour. You know, we have an old wives’ tale here about black rice. If dwarves should ever kidnap you and bring you to their realm, do NOT eat the black rice because if you do, you have to stay with them forever. But now, it’s supposed to be chockful of good stuff. Huh. And don’t forget coloured vodka’s! I have a friend whose specialty was blue pikelets. Well, she coloured them blue. They were sort of greenish when cooked. My mom always dyes pancakes green for St. Patrick’s Day . . . along with various other foods. Awesome. cupcake recipe anyone? those rainbow cupcakes are spectacular! My son and I have made these rainbow cupcakes they’re actually pretty easy. It’s just a white cake mix and all you have to do is separate even amnts of batter into separate bowls and food color them to the desired color and spoon them in cupcake wrappers put ’em in the oven and bake…fairly easy…and yes very very pretty!! Then it looks like it’s just whipped cream for the topping, you can spoon it into a plastic bag and cut a corner off and squeezeit out in the spiraly shape that’s on there!! OMG you guys have Heinz as well! I thought it was an Australian brand. And it’s obviously made in America too because ours say ‘Tomato Sauce’ and we get the squeezy upside down bottles. *sigh* i thought we were cool and unique in something…….